On the windswept coast of north-west England two great rivers, the Mersey and the Ribble, release their waters into the Irish Sea. Between them runs a 20-mile chain of golden sandhills, separating coastal towns and salt-tinged farmland from the sea. These are the dunes of the Sefton Coast, the largest open system of sand dunes in England. Here delicate orchids, rare lizards and prehistoric footprints might be glimpsed alongside expansive beaches and glittering pools. 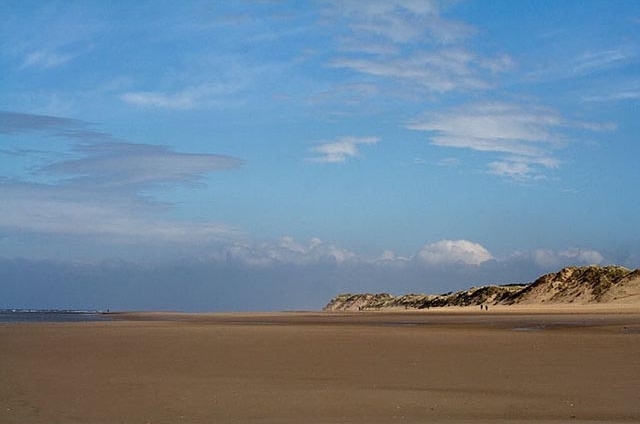 Covering 5,000 acres (2,024 hectares), the Sefton dunes sweep in an arc starting at Crosby in the south. They pass the built-up areas of Hightown, Formby, Ainsdale and Birkdale, ending on the fringes of Southport in the north. The highest point is at Formby, where they rise to 65ft (20m) above sea level, and are at their widest around Ainsdale and Birkdale, where blown sand reaches 2½ miles (4km) inland. The dunes form a natural barrier between sea and land, preventing flooding and protecting important areas of development and agriculture. But they are not a static barrier, they are a dynamic and harsh landscape, constantly changing and home to highly specialised plants such as marram and sand couch, and animals including Britain's rarest and most protected reptile, the sand lizard. The full feature on the Formby dunes appeared in the Spring 2016 issue of LandScape. For back issues click here or to subscribe to LandScape, click here.